Martin Roman Rebelski is the unofficial fourth member of Doves. When Doves were recording Here It Comes in 1998, to be released on their own Casino label, they were looking for a keyboardist to play on the track. Doves heard of Rebelski through a mate of Rob Gretton, who recommended him. Rebelski was hired as a session musician, but would soon be performing live with the band. That still remains the case to this day. Whilst playing with doves, Rebelski has also released some of his own music. His first release was a 7″ vinyl single called Scarecrow. This was sold at doves winter tour shows of late 2002. The debut album Thanks For Your Thoughts soon followed in 2003. See the video for Walkie Talkie, directed by Matt Norman here. Rebelski’s debut live performance was at the Royal Albert Hall. 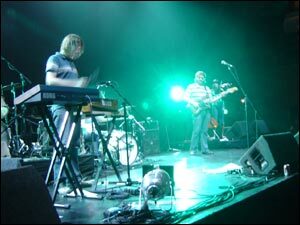 Supporting Doves, as they played a show for the Teenage Cancer trust on March 27th 2003. He was joined on stage by Jimi & members of Beats For Beginners. Beats For Beginners singer and songerwriter Mike TV joined Rebelski, for the writing & recording of the second album Stickers On Keys. With a recommendation from Damon Gough, Twisted Nerve signed up for the release of the second album. See BBC News Article. 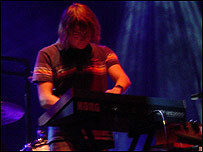 Rebelski played several support slots for Badly Drawn Boy in 2004. In 2007 The Swarm was used on a tv ad for hiscox. In 2008, Rebelski scored the soundtrack to the short film “The Value Of Hard Work“. Rebelski has remixed several doves tracks. His most popular, is his take on The Sulphur Man. Arguably even better than the original. (Ok that’s my opinion anyways). Initially only available on the Caught By The River vinyl. The track was finally made available on CD, when it appeared on the Lost Sides Bonus disc in 2003. A remix of The Storm appeared on the Sky Starts Falling CD single in 2005. A new Rebelski album Witch In A Bottle was released worldwide to itunes November 2009. Rebelski continues to record and release his own music. He is also a touring member of Peter Hook’& The Light. Martin Rebelski is no stranger to big gigs. With Doves, he’s played festival main stages and theatres all over the world, but it’s different when you’re in charge. Especially when you’re totally in charge. As his bus toils around Manchester picking up the various members of his live band, the fact that his manager is at home with a bad back and he’s in charge of himself and everyone else today seems to be weighing heavily on him. When he arrives at violinist Lizzie Hoskin’s place to find her A string broken and no time to fit in a trip to the music shop for a replacement, the weight gets heavier. Thankfully, his band are also, for the most part, long time friends, so a quick phone call ahead to London, where cellist Naomi Hart is already ensconced, allows the plan to keep to schedule, as she is dispatched into the metropolis to find a new string and Martin’s rising nerves are calmed. To read the full three page article at the BBC website, click here.